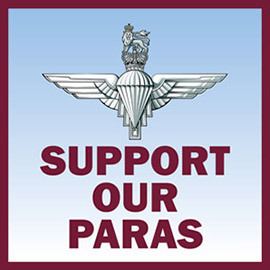 As we are owned by SUPPORT OUR PARAS, our profits go directly to the charity, so you can be assured that each and every purchase that you make with us will benefit The Parachute Regiment and Airborne Forces. Royal Mail: If you are not in when Royal Mail try to deliver your item, they will normally post a card through your door with details of how to collect your parcel. They will then take the parcel to your local sorting office/depot where it will be held for 1-2 weeks before they return it to us (we will charge a further delivery charge to repost the items if this happens). If you haven't received your order within a week of posting please contact your local sorting office to ensure that they are not holding it for any reason. Courier Deliveries: All courier services require someone aged 18 or over present at the time of delivery to provide a signature. If no one is home when the couriers attempt delivery they will post a card through your door with their details on and it is then your responsibility to contact them to arrange redelivery. Please note that the couriers will return the goods to us if they are not contacted within 3 working days, and a further delivery charge will be applicable for us to re-send the items. We're happy to send your order an address other than your billing address (e.g. work address, relative). In the interest of fraud prevention, we reserve the right to query alternate delivery addresses where necessary - Please ensure that you include a telephone number for the delivery address to avoid delays. You can enter the alternate delivery address during the checkout process. Please note that delivery charges are based on the delivery address, not the billing address. For Royal Mail deliveries, although they generally arrive within a couple of days, they may take up to 15 working days to get you. We are unable to send out replacement items until the 15 working days has passed. If your chosen delivery method offers tracking, this information will be sent to you when your order has been dispatched. Occasionally, your item may get held at your local sorting office so we do highly recommend visiting them if your item has not been delivered within a week. For courier deliveries, please contact us and we will chase up your delivery with the couriers. Please click here for our full Delivery Information page, which includes details of our delivery services and expected arrival & dispatch times. Our preferred method of payment is credit or debit card using the Sage Pay system. Sage Pay are the expert credit/debit card processing division of the renowned Sage group. We currently accept Visa, Visa Debit, Visa Electron, Mastercard and Maestro cards. Using this method, your card details are only ever seen by Sage Pay who have the highest level of card data security available. If you would prefer to use your PayPal account, we also welcome PayPal payments either through the link on the shopping basket or during the checkout. Please ensure that your postal address is correct in your PayPal account as this is the address that we will post to. If the address is incorrect, your order will be delivered to the wrong address and it will be your responsibility to retrieve your parcel from that address. We are also happy to accept cheques, however you will need to contact us to arrange this before ordering. All cheques should be made payable to 'ABP Retail Ltd'. Cash is only accepted if you are purchasing in person, please do not send cash in the post! We understand that some people prefer to speak to a real person so you're more than welcome to phone us on 0115 8192173 and we can process your order and payment over the telephone. Please check our Contact Us page for opening times. We hope that you will be highly satisfied with any product purchased on from us but if you wish to return an item to us then we aim to make it as quick and convenient as possible. Any standard item (excluding Personalised clothing or bespokely ordered items) may be returned for any reason within 30 days of the date of despatch so long as it remains in a saleable condition. Please note that you will be liable for any shipping costs incurred when returning the items back to us. We require notification of your intent to return the item, either by telephone, email or posted letter, prior to receiving the item back - This is to ensure that you are aware of our procedures, any redelivery costs you may have to pay and to ensure that your return/exchange is dealt with efficiently. If you are returning the item back in exchange for another item: You may need to pay a further delivery charge for the new items. We will advise you of this charge when you contact us to discuss the exchange. Once the item is received back and the redelivery charge has been paid, we will send out your new items. If you are returning the item back for a refund: Once the item is received back, we are happy to refund the original amount paid, minus the original delivery charge. In the unlikely event that your product arrives faulty or damaged, we must be notified within 7 days of delivery. We will then work with you to organise a return of the product, followed by either a replacement or refund. You may be required to post the item back to us, however we will reimburse you for the postage costs if the product is deemed faullty/damaged upon inspection. Please note that certain items (earrings, etc) cannot be returned for hygiene reasons. Where returns aren't possible, this will be noted on the product description. Please contact us before ordering if you are in any doubt over the product's size, colour, etc so that we can offer some advice. In certain circumstances we would be happy to send you a sample garment before ordering. - Discounts will only be made available once we have verified your PRA membership with RHQ. - To receive discount online you will need to log in to your account on the website. - If ordering via the telephone, please quote your PRA number to the member of staff. - We are unable to apply discounts retrospectively. - Discounts are not available on charity items (wristbands, etc) or items which are already discounted. - We reserve the right to alter or withdraw the discounts at any time. Click here for the discount registration form. How Do You Make Sure Your Website Is Secure? AirborneShop.com has been built using award winning ecommerce technology to ensure that your shopping experience with us is as secure as possible. We constantly update the website to combat emerging ecommerce security risks so you're always protected! All of our payment pages use SSL encryption to ensure that your payment details are secure. Also, with online payments, your card details are only ever seen by you and our payment provider - We don't see your card details at all! How Do You Use My Data & Protect My Privacy? Any information we take is kept on secure systems, solely managed by us. Access to these systems is strictly limited to authorised staff, with all access being monitored and logged. Your security is very important to us and we take every available precaution to ensure that your personal information is not accessed or used inappropriately. We will use your personal information to aid us process your order. We may also use your email address periodically to send you information about offers and promotions. You can opt out of these mailings at any time by emailing us. Please click here for our full Terms & Conditions page.